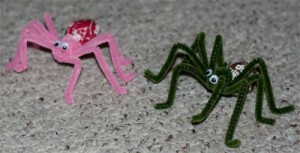 I saw something similar to these and had to make them for Megan to take to her class for Halloween. They only take a few minutes to assemble; and would be great for 5 year old+ hands to put together. 1. Hold all 4 pipe cleaners against the stem of the sucker, right at the base of the sucker. 2. Leave the length of pipe cleaner desired for the legs of the spider on one side (about 3 inches) and wrap the other side around the stick until both sides are equal in length. 3. Pull the ends of the pipe cleaners tight. Then bend them upwards and into a 7 shape for each leg. 4. Cut the stick at the base of the pipe cleaners. 5. Glue on the googly eyes and get ready for some giggles. Thanks for the tag, Tara. Sorry that it took me so long. 1. Affectionate gestures from either of the girls. 3. Finishing any project; whether it be art, organizing, weeding, or canning. I love that moment when I get to stand back and look at what I have accomplished. 4. Having a clean and/or organized house (sigh). 8. Running to good music. 9. House stuff. If you know me, you know I am little obsessed with anything having to do with home stuff-from architecture to decoration. I especially love anything kitchen related–ask my Mom, even when I was a little girl, I loved kitchens and bathrooms. 10. Finally, watching my girls sleep. I love checking in on them and night and seeing their beautiful little angelic faces. It just makes me feel so happy. I think Heavenly Father gives us those peaceful moments as both a reward and a sort of renewal for those hectic days! Thanks again, Tara. This has been fun to think about. I tag Michael (hehe, just do it, honey. It will be fun.) Pamela, Amy, MaryAnn, Kerrah, Kristine, Michelle and DeeDee. I like to keep an eye on a blog called Grosgrain; mostly because Kathleen sews amazingly cool stuff and sewing is an area that I have no skill, but much admiration for. I was totally blown away when I saw this Marie-Therese dress. I can totally imagine Megan in it! The most unbelievable thing is how often she gives away what she makes. This dress included. Wow. Check it out here. If you know me, you know that I love to decorate. You also know that I am all about doing it on the cheap. I wanted something for my picture rod, but these would look cute hanging from your porch or tacked on the casing of a window. I love all of the different textures with the burlap and screening. The bonus is that it is pretty quick to put everything together and there is NO sewing involved. 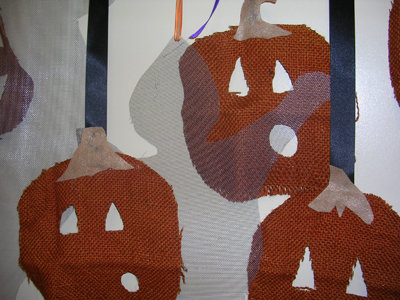 Although it would be cute to stitch around the pumpkins; I wanted to go for more of a folk art, simple look. 1. 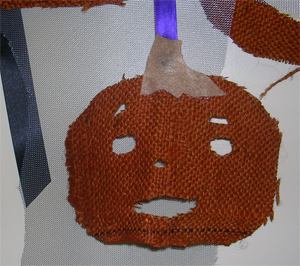 Layout the burlap and sketch some jack-o-lanterns onto it. Then cut out. 2. Cut stems from the felt and glue onto pumpkins. Turn the pumpkin over and dribble glue on the top 1/4 of the pumpkin to help keep it flat when hanging. 3. If using ribbon to hang them, glue the ribbon to the stem and top of pumpkin. 4. Unroll the screen and sketch the desired ghost design; then cut out. 5. If using ribbon to hang the ghosts, you can push a hole in the screen with the tip of the scissors. Then thread the ribbon through. 6. 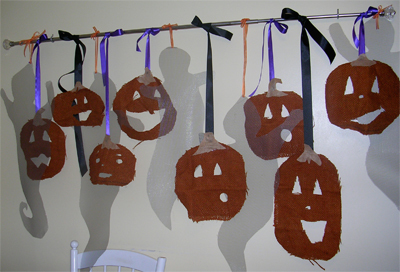 Now hang your ghosts and pumpkins up, layering them so that they are overlapping in places. * A note on the screening: I used the aluminum because I wanted the metallic color. It also comes in black and grey. The aluminum was a bit of a pain to deal with-literally. The little threads are much like slivers as you are cutting. If I were to do it again, I think I would settle for a shadowy grey. I think it would be a lot more pleasant to deal with. 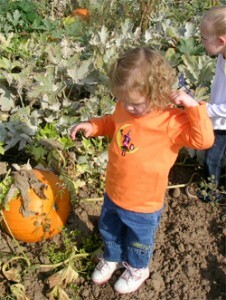 We went to a pumpkin patch with Megan’s preschool class on Friday. 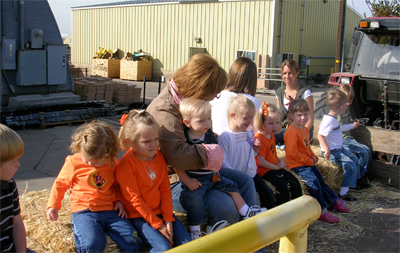 The girls loved taking a hayride out to the field. As soon as she was off the wagon, Megan announced that she would get her own pumpkin and headed out to the farthest reaches of the field with her cute little friend. 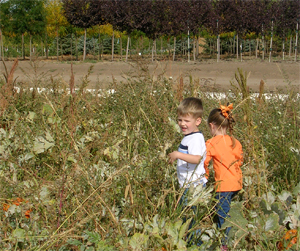 They pretty much covered the perimeter of the field; and sure enough, Megan came back at snack time carrying her own pumpkin. She is Miss Independant!